The noble kingfisher is seen here. Kingfishers (Rexavis Regovoris) are very large birds of prey indigenous to many areas of Asia, Europe and North America. They have powerful hooked beaks for tearing flesh and strong talons for gripping prey. Their wingspan often exceeds 20 feet. Despite its suggestive name, the kingfisher does not, of course, dine on kings exclusively. It also hunts queens, emperors, princes, dukes, viceroys and any other high-ranking members of the nobility. Kingfishers have even been known to capture and devour mere knights and dames, but such incidents are extremely rare. Due to their large size and great strength, kingfishers are capable of carrying off and devouring all but the most portly of monarchs. 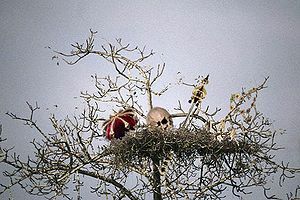 A typical kingfisher nest, littered with royal trinkets. The kingfisher is known to reside in any kingdom, empire, feudal state, or other territory under absolute rule. It can often have extremely great range in order to seek out well-traveled nobles and to combat rapidly changing political boundaries. For example, when France's borders fluctuated wildly in the 1800s under Emperor Napoleon Bonaparte, kingfishers patrolling previously uninhabited lands would often find Dukes or Earls traveling to newly conquered lands to be easy prey. Kingfishers are known to nest in tall trees and on cliff tops. However their nests are most often found high up in caves. The most obvious sign of a kingfisher roost is often not the nest itself, but rather the litter of crowns, sceptres, staves of office, and other assorted regal paraphernalia strewn beneath it. Like its distant relative, the owl, the kingfisher will often swallow its prey whole and later regurgitate the indigestible portions. It is believed that these hoards of royal stuffs gave rise to many of our myths and legends. For example, in ancient times, credulous peasants finding these piles of gold and jewels in caves attributed their presence to the avaricious collecting instinct of dragons. However, paleontologists believe that dragons became extinct long before the first human king ascended his throne, and thus these common folk had simply stumbled upon the nest of a kingfisher. In addition, such peasants finding said kingfisher nests and actually glimpsing the noble kingfisher were not very likely to live to tell the tale, as kingfishers will defend their nest and their adorable young quite viciously. 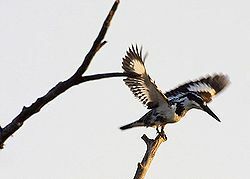 Although kingfishers will not knowingly attack persons of low blood (unless defending their nests), dozens of commoners are unnecessarily killed or injured by them every year. Most of these incidents occur around Halloween, when people living near kingfisher hunting grounds dress as royalty and are mistakenly carried off by kingfishers. Small girls dressed as princesses often make easy meals for kingfishers, and it is not uncommon to see the birds of prey teaching their young how to hunt on this night every year. Due to the nature of their prey, kingfishers have been responsible for the deaths of many notable historical personages. Perhaps the most famous example would be Henry VIII, who himself was carried off by two kingfishers while attending the beheading of one of his dozens of wives. It is estimated that his violent suppression of the Protestant Reformation led to even more monarchies springing into being in Europe at that time, which rendered his reign to be the so-called 'Golden Age' for kingfishers. Another set of well-known victims were George II through V (inclusive), who were all carried off by the same kingfisher in the 1700s. George VI himself located and slayed the bird in question, and it was served as the main course at the royal Midsummer Banquet in 1796. Other victims of kingfishers include Martin Luther King, Jr, The Duke of Earl, and Elvis Presley. Other celebrities have been more fortunate, narrowly avoiding kingfisher attacks. For example, Manfred von Richthofen, more commonly known as the Red Baron, was repeatedly accosted by kingfishers during his time as a German pilot during World War I. Von Richthofen was lucky enough to escape with his life each time. French emperor Napoleon Bonaparte was attacked by kingfishers several times, but due to his short stature he presented an insufficient target to the birds of prey and they were forced to admit defeat like so many of Bonaparte's adversaries. Another near miss involved Don King, who was once swooped upon by a kingfisher in a public park near his home. However, the bird was scared off by King's intimidating plumage. 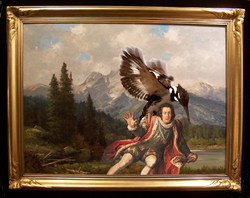 A rare artist's impression of the kingfisher and its prey. Unfortunately, like so many birds of prey, the kingfisher is now classed as an endangered species. Global trends, characterised in particular by a significant increase in worldwide democracy levels, have led to a marked decline in the kingfishers' prey populations and hence in the kingfisher population itself. In recent years, however, numbers of kingfishers in some areas have begun to rise again, as certain groups have adapted to feed on presidents, members of parliament and other high-ranking elected officials. As such, new 'watchdog' groups have been established to keep an eye out for kingfisher activity in centers of democracy. Although they are not watching for dogs at all, and so are poorly named. Kingfishers that have not learned to cope with the steady decline of monarchies are still known to exist, although they have become an exceedingly rare sight. Royal families that exist solely in a figurehead position, with no sort of power whatsoever still fall prey to these vicious hunters every year. However, the blood of these families has become increasingly diluted due to marriage with common folk, and also because of the massive blood loss associated with kingfisher attacks.